(Tinmoitruong.vn) - Ben Tre Province, one of the largest salt producers in the Cuu Long (Mekong) Delta, has harvested 30 per cent more salt this season because of the prolonged hot weather and high salinity level of sea water. Ben Tre Province's salt producers work on salt field. Ben Tre, one of the largest salt producers in the Cuu Long (Mekong) Delta, has harvested 30 per cent more salt this season. The harvest for the 2014-15 season was 75,000 tonnes, the province's Department of Agriculture and Rural Development said. With prices at about VND1,000 a kilo, farmers can make higher profits from salt than from rice cultivation. 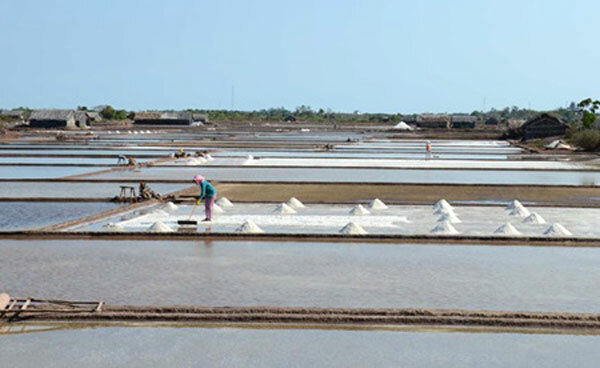 Ben Tre has about 1,600 ha of salt fields, mostly in the coastal districts of Binh Dai and Ba Tri. The province has encouraged farmers to use canvas sheets on fields to produce cleaner salt. Fields lined with canvas sheets protect the salt from soil contamination, improving quality. 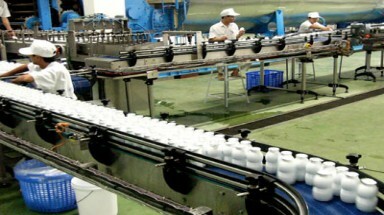 Nguyen Thanh Hong, chairman of the Ba Tri District People's Committee, said the district has encouraged farmers to produce cleaner salt to sell to iodised-salt plants. In the 2014-15 salt producing season, Bao Thanh Commune, which has the largest salt-producing area in Ba Tri, has 10 households using canvas sheets on fields on a total area of 7ha. Nguyen Minh Luong, in Bao Thanh Commune's Thanh Loi Hamlet in Ba Tri, has invested VND20 million (US$950) to buy canvas sheets to line 900 sq.m of salt fields. "With this new production method, I get a higher salt yield and better quality compared to traditional methods," he said. "I'm no longer afraid of not finding outlets for my salt as traders will come to my field and buy the salt at a higher price." Trinh Hoang Be, deputy chairman of the Bao Thanh People's Committee, said the commune households that use canvas sheets to produce cleaner salt had achieved better results. These salt yields have good quality and can be used for industrial salt and iodised salt for human consumption, he said. The Bao Thanh commune plans to work with the province's Rural Development Sub-department to ask companies outside Ben Tre to sign contracts to buy salt from the households. The commune will also create favorable conditions for local farmers to borrow loans to invest in canvas sheets, he said. (Tinmoitruong.vn) - Hida beef, produced from black-haired Japanese cattle, will be transported to Viet Nam in 2016. Why are 3G service fees in Vietnam cheap? (Tinmoitruong.vn) - Hanoi, 6th December 2017- Leading CEOs from Vietnamese and German businesses have taken a strong stand promoting sustainable development through responsible use of natural resources in the Forum “Beyond APEC 2017 – Sustainable development opportunities for corporate sector” held today in Hanoi. (Tinmoitruong.vn) - Mr. Tat Thanh Cang, deputy chairman of Ho Chi Minh City People’s Committee, said it is impossible to extend the removal deadline on December 31 to polluting businesses in the city, at a meeting on Wednesday. Environmental News - News about Vietnam environment. License published 65/GP - STTTT, issued on 15/08/2011. Address: No. 63 Suong Nguyet Anh, Ben Nghe Ward, District 1, Ho Chi Minh City. Phone: (+84) -8.39.250.638, Fax: (+84) -8. 39,250,639. Email: tinmoitruong@tinmoitruong.vn - Website: www.tinmoitruong.vn. Write www.tinmoitruong.vn when using the information from this site.